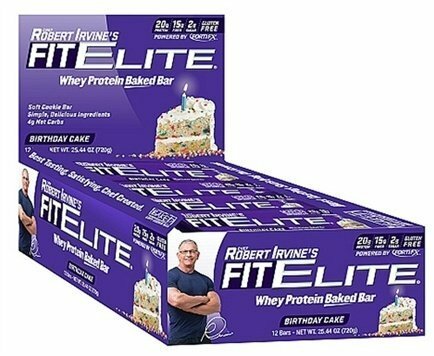 FortiFX FIt Elite Bars are delicious, high protein bars created by Robert Irvine, a popular and accomplished chef. The bars are gourmet quality, soft-batched baked. They contain 20 grams of protein, balanced by 15 grams of fiber, and only 4 grams of net carbs. Fit Elite Bar's are gluten-free, and utilize whey isolate protein. With only 2 grams of sugar, you can enjoy these bars guilt-free. Perfect for post-workout nutrition, or a convenient option for mid-afternoon snacking. Enjoy a FortiFX FIt Elite Bar any time of day, especially as a snack option, or as part of your post-workout nutrition. Percent Daily Value (DV) are based on a 2000 calorie diet. Proprietary Fortifx™ Protein Blend (Whey Protein Isolate, Milk Protein Isolate, Isomalto-Oligosaccharide (Prebiotic Fiber), Water, Unsweetened Chocolate, Cocoa Butter, Vegetable Glycerin, Almonds, and Organic Vegetable Oil., Contains 2% or less of the following: Salt, Natural Flavor, and Sucralose. Contains milk, almond, peanut, and soy products. Manufactured in a plant that processes milk, soy, wheat, tree nut, peanut, and egg products. Proprietary Fortifx™ Protein Blend (Whey Protein Isolate, Milk Protein Isolate, Isomalto-Oligosaccharide (Prebiotic Fiber), Almonds, Organic Vegetable Oil, Vegetable Glycerin, Water, Evaporated Cane Juice, Rice Flour, and Cocoa Butter., Contains 2% or less of the following: Chicory Root, Sunflower Oil, Tapioca Starch, Cocoa, Salt, Natural Flavors, Chocolate Liquor, Soy Lecithin, Baking Soda, and Sucralose.